Some people have neck pain that may radiate into the shoulder and arm. This type of pain is often caused by an injury near the root of a spinal nerve. A nerve root injury is sometimes referred to as a “pinched” nerve. The medical term for this condition is cervical radiculopathy. As disks age, they lose height and begin to bulge. They also lose water content and become stiffer. As the disks lose height, the vertebrae move closer together. The body sees the collapsed disc as a possible weak area and responds by forming more bone – called spurs – around the disc to strengthen it. The bone spurs that form also contribute to the stiffening of the spine. Bone spurs may also narrow the area of the foramen and pinch the nerve root. The disc changes that occur with age are often called arthritis or spondylosis. It is important to keep in mind that all these changes are “normal” and they occur in everyone. In fact, if MRI scans were performed on all people 50 or older, nearly half of the scans would show worn discs and pinched nerves that do not cause painful symptoms. It is not known why some patients have symptoms and others do not. Cervical radiculopathy pain travels down the arm in the area of the involved nerve. Pain is usually described as sharp. There can also be a “pins and needles” sensation or even complete numbness. In addition, there may be a feeling of weakness with certain activities. 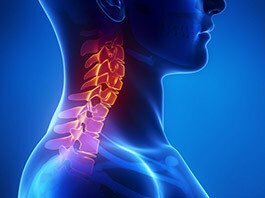 Symptoms can be worsened with certain movements, like extending or straining the neck or turning the head. These symptoms are often made better by placing the hand on the head and stretching the shoulder.